We’re between series this week at North Ridge. Last week finished up Man School, next week we begin The Bible: It’s Not About You. Today we took a step back to revisit the series that launched 2012, My One Word. To recap, My One Word is our New Year initiative to pick a single word to emulate throughout 2012 instead of making a list of resolutions to achieve.Today we revisited the words we picked and were encouraged to continue striving towards adopting the word as part of our character. I appeal to you therefore, brothers, by the mercies of God, to present yourselves as a living sacrifice, holy and acceptable to God, which is your spiritual worship. Do not be conformed to this world, but be transformed by the renewal of your mind, that by testing you may discern what is the will of God, what is good and acceptable and perfect. The word I chose back in January was bold. To be honest, I felt like selecting that word was a cop-out. For one, simply ‘bold’ is a vague characteristic. Bold about what? There’s a fine line between being bold and flat-out rude! Second, My One Word led into a series titled Bold; picking the same focus for myself that we were studying as a church seemed quite “convenient”. Nevertheless, I could not get away from that word so I have stuck with it. Over the last seven months, that word has evolved, honing in how this boldness will manifest. Just in the last few days, this re-focusing on my word has inspired the word to change. My new word for the year is ‘speak’. Speaking is where I have chosen to focus my boldness because it is the area in which I am weakest. Call it a lack of confidence, a passive nature, or a fear of rejection; but my goal is putting forth a conscious effort to speak my mind and voice my opinions at every opportunity. Doing this requires a certain level of compassion, I do not want to mistake arrogance for boldness in my words. I found the inspiration for my word in 2 Timothy 1:7: For the Spirit God gave us does not make us timid, but gives us power, love, and self-discipline. Selecting my new word is the first avenue of inspiration for today’s drawing. 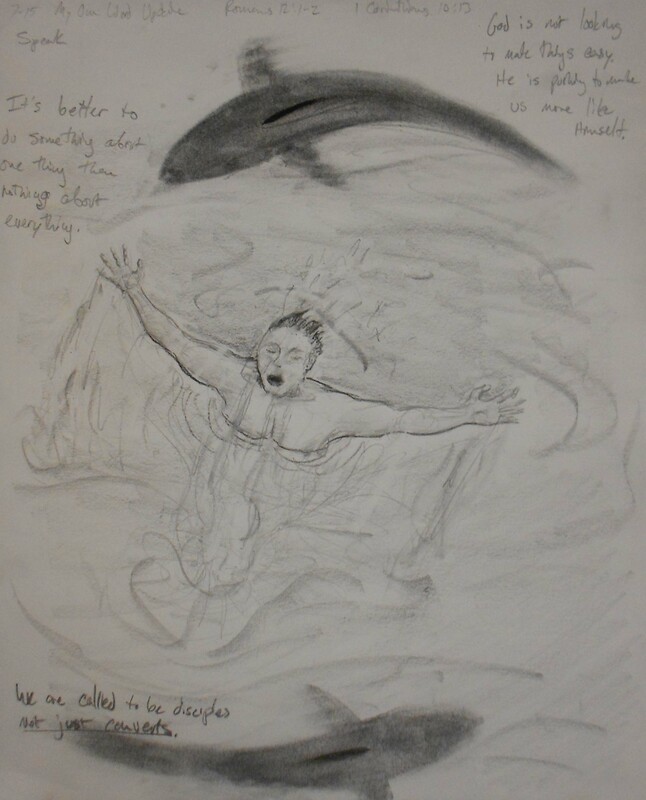 Realizing where I wanted to focus my boldness felt like release in my spirit, symbolized by the figure breaking through the water’s surface. The expression on the figure’s face shows relief, despite the shadowy figures circling around him. The shadows represent the situations that arise to test our commitment to bettering ourselves, temptations to abandon our goals, and the premature pride from thinking minor victories means we’ve arrived. Deciding to make positive changes in your life with God’s help does not mean the task will be easy, in fact it means the opposite. God will teach you the characteristic selected with My One Word by placing you in situations that require using that quality. It can really be quite frustrating! Are you wanting to be more patient? Expect to face situations that will test your patience. Is your goal to be more honest? Expect hard questions and to give hard answers with increased frequency. My word brought opportunities to take on new risks by stepping out on my own. With my new focus, I am expecting more instances to share my ideas, though it’s not always the most popular. (I had to choose this during an election year….DOH!) God is not looking to make things easy, He is pushing us to become more like Him.